With Windows XP (SP2) and Vista, there is a limitation imposed by Microsoft on the number of concurrent connections that can be established using TCP/IP to 10 or 25. This is for security reasons. While that is a good thing, it impacts heavily on the performance of multi-threaded Internet applications, such as proxy scanning software like Charon. The tcpip.sys file is the culprit here and requires either patching or a utility to bypass this problem. For a newer, easier way around manually modifying the system file, TCP-Z is the tool for the job. This tool modifies TCPIP.sys in memory and requires no restart. 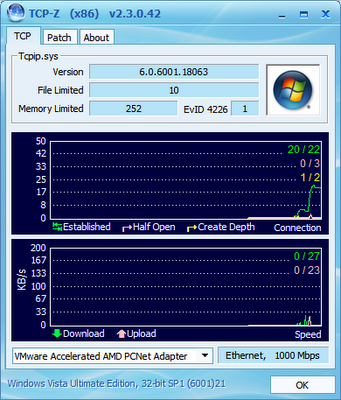 TCP-Z can be used manually or installed as a virtual device to run in the background and automatically increase the connection count. Real-time monitoring of DL/ULrates, number of connections and half open connections. Version at time of writing: V2.4.0.46, Build 20090108. Note: At the time of writing, the developer was also working on a patch, because some people have trouble using this program with their AV software and also, there are people who prefer a patch over a utility. I feel the need to write something on this subject as a product of my investigations into Internet anonymity. At the time, like a lot of other individuals rightly do, I felt the need to maintain or at least, provide myself a way to activate a state of Internet anonymity – in this case, by using a type of proxy service. Before I go any further, I would like to point out that I have covered in a separate article a service that I think ranks in priority to that of a singular proxy server or other services (if you want security without paying for it) – both in the level of protection and convenience. See here: JonDo. Also I am aware of this great service: HTTP Tunnel Service, which also ranks highly as a great proxy service. But please read on to learn a little more more about proxy services. Ok, in this inaugural post for the Useful Tips section, I thought I’d type this out because it is a problem I just encountered with a notebook, running Vista Home Basic – which, by the way didn’t have an installation CD for Vista (just a recovery image). I really didn’t want to take the extreme approach of using the Toshiba restore option, which would mean losing all my personal data. The notebook came with a restore image on another partition – that was Toshiba’s version of “comes with Windows Vista Basic”. Those who have run into the LogonUI.exe problem will know that they cannot do anything within the OS to rectify it, because they can’t login, as there is no Log-In GUI (Graphical User Interface) – just a blank screen with the cursor showing. cd c:\windows\system32 and hit enter. This path is the default one, so adjust yours to suit the drive and folder name that you installed windows under. Trying without the step just mentioned resulted in failure. I had to force the system to place a new dll in the \System32 directory. Close the prompt window/select the menu again and choose the Restore Points option. Once there, choose the last automatically generated System Protection Restore Point and go from there. Needless to say, there is something to be said for not disabling restore points – I know we’ve all been there before (well, most). Also, I have heard that this problem can be caused by a virus injecting itself into the dll.. I hope this was helpful to you.. If you liked this article.. This section is intended to contain useful information in the aid of troubleshooting a problem, or just simply being useful in some respect. Anyone can add their favourite pick of knowledge they’ve acquired.